Willing to adapt his schedule for the opportunity to witness “a historic event,” Jim Kenney made the early morning drive from southern Indiana to Indianapolis on Oct. 18—the day that Archbishop Joseph W. Tobin was introduced as the new archbishop of the archdiocese. A member of St. Anthony of Padua Parish in Clarksville, Kenney was already planning to come to Indianapolis for a meeting later that day when he learned the night before about the press conference at SS. Peter and Paul Cathedral. Archbishop Tobin, 60, succeeds Archbishop Emeritus Daniel M. Buechlein, who resigned in September 2011 at age 73 for health reasons. He had headed the archdiocese for 19 years. Auxiliary Bishop Christopher J. Coyne has been serving as apostolic administrator of the archdiocese, and will continue in that role until Archbishop Tobin’s installation. Bishop Coyne introduced Indianapolis’ new shepherd at the news conference, but first paid tribute to Archbishop Buechlein, who was in attendance. The retired archbishop, a Benedictine monk, lives at Saint Meinrad Archabbey in southern Indiana. In his remarks, Archbishop Tobin talked about faith as “the capacity to be surprised by God. 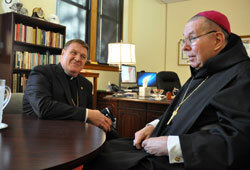 Archbishop Tobin described his appointment to lead the archdiocese as “a wonderful and daunting mission. “I’m coming with a missionary’s heart to learn where God is opening a door for the Catholic Church in central and southern Indiana,” he said. Archbishop Tobin thanked Archbishop Buechlein “for what you did for this Church for 19 years, for your example as a bishop, first in Memphis, then in Indianapolis and now in retirement. “Like Pope John Paul II, you showed us the dignity and the acceptance of the Cross, and that suffering doesn’t have the final word,” he said. As the Hispanic ministry coordinator for the archdiocese, Franciscan Brother Moises Guiterrez was touched when Archbishop Tobin used part of the press conference to speak Spanish as a sign of his connection with the Latino community. Father Michael O’Mara, pastor of St. Mary Parish in downtown Indianapolis, has a large Hispanic presence at his parish. He, too, was excited that the new archbishop will offer “continuity” to the outreach that Archbishop Buechlein offered to Spanish-speaking Catholics. “The Latinos also want to feel that the archbishop is their pastor, and they are going to feel that,” he said. Mother Mary Vincent Mannion also was thrilled by Pope Benedict XVI’s choice of Archbishop Tobin to lead the nearly 228,000 Catholics in 147 parishes in central and southern Indiana. “I am so delighted,” said Mother Mary Vincent, superior of the Little Sisters of the Poor at the St. Augustine Home for the Aged in Indianapolis. “It’s a wonderful archdiocese to be a part of so I’m sure he’s happy, and we’re happy with him, too. Providence Sister Denise Wilkinson said members of her order were eager to meet the new shepherd. Many priests from across the archdiocese also attended the press conference, viewing it as an opportunity to see and meet the new archbishop while also visiting with and paying tribute to Archbishop Emeritus Buechlein. “I was really impressed with how prayerful and spiritual he is—very much like Archbishop Buechlein in that regard,” said Father John Hollowell, administrator of Annunciation Parish in Brazil and sacramental minister of Sacred Heart of Jesus Parish in Terre Haute. Father Patrick Beidelman also noticed the connection between the two archbishops. As the president of Marian University in Indianapolis, Daniel Elsener was pleased to hear the new archbishop’s strong support of Catholic education. Father Rick Ginther, who was recently appointed director of the archdiocesan Office of Ecumenism, was struck by Archbishop Tobin’s commitment to a missionary spirit across the archdiocese. “That sense of the missionary spirit is going to be crucial for us in the new evangelization, and that will be in every parish, in every county, in every city, in every rural area, bringing the faith in a renewed way to those that are on the margins of the Roman Catholic Church right now,” said Father Ginther, who also serves as pastor of St. Margaret Mary and St. Patrick parishes in Terre Haute and as dean of the Terre Haute Deanery. Father Noah Casey also praised the unique perspective that Archbishop Tobin will bring to the archdiocese. Several priests commented on the continuity of leadership for the archdiocese that has extended from Archbishop Buechlein to Bishop Coyne and now to Archbishop Tobin in the past 13 months. “It is an exciting day for the archdiocese,” said Msgr. Joseph Schaedel, pastor of St. Luke the Evangelist Parish in Indianapolis. “I think Bishop Coyne has done a wonderful job in the interim, but we’ve been anxiously awaiting a permanent archbishop as we move forward on so many of the initiatives that Archbishop Buechlein started, and we have continued this ministry under Bishop Coyne.